I was getting a pedicure and manicure the other day and while I was thumbing through the latest gab magazine I saw an add for “Slim Shots”. Cute little creamer size containers that you drink to lose weight. They looked so adodrable and easy to use. 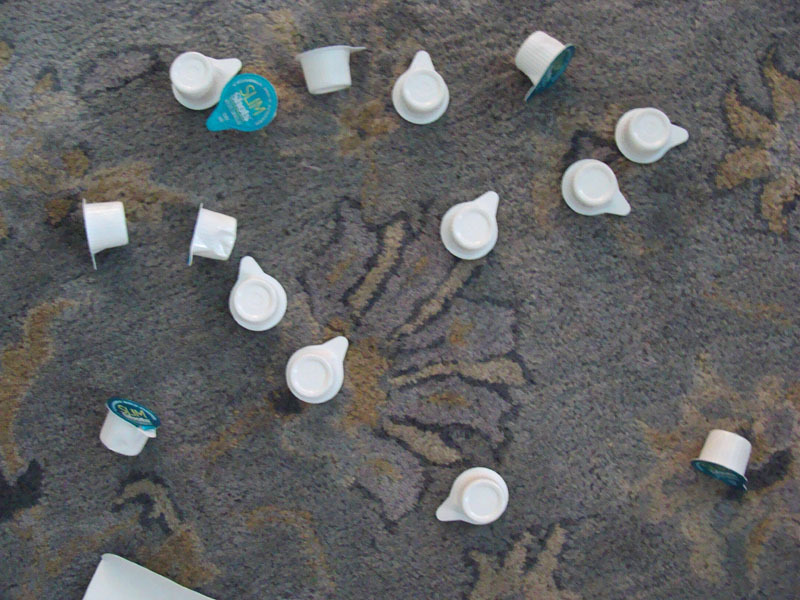 All those pills and special bars have a drug connotation to them – but this was this harmless little creamer. Maybe I would give it a try. So after my pampering was over I padded over to the CVS next door in my little flimsy flip flops, shuffling along since they are basically paper. I get in there and remember as I go through the aisles that I need a few other things. I never think to get a cart in that place as I never think i am going to buy very much. Wrong every time. My hands are basically full by the time I get back to the diet section. There is one lonely and dented in box of Slim Shots left. Uughh. I hate to have to ask questions about personal products. I am from the generation that didn’t ask for condoms, or tampons. And we always bought them with lots of other stuff we didn’t need so it wouldn’t look like we needed what we really came in for. I get past my embarrassment since the alternative is to go to another store in my flip flops in the dead of winter – which is more embarrassing – it was a toss up – so laziness won and I asked the lady stocking the shelves ” Excuse me, this box is all dented in, do you perhaps have another?” “No, that’s it – they are popular” she said. I love being on the cusp of a trend. Then she said she would open the box for me, remember my hands are full, and make sure all 30 were there and in good condition. How helpful I thought to myself. Yes indeed, all thirty were there, she closed up the box and sent me on my way to weight loss heaven. I am now laden down with about 8 items. I have hair spray, hair brush, toothpaste, dental floss… Did I mention that I got my nails done also, so I was being kind of careful how I held everything so as not to smusch the nail polish on my hands. So I get up the the counter and there are about 6 people in each of the two lines. I don’t know about your CVS but, we have the oldest, nicest but slowest check out grandmothers that work at the counter. They are so cheery but so freakin slow. My arms are getting tired and I must have looked just like a little odd, with my fingers carefully stretched out and my flip flops and all that crap in my arms. I try to hide my Slip Shot box so people don’t say to themselves ” Yeah – you’ll be needin a little more than that to get slim” . You know the way I say it when I see overweight people jogging. What goes around… And then it happens. I turn to look at the candy at the end of the aisle, I Know I know, the Slim Shot does not go with candy as the chaser. As I turn back all of a sudden the top of the Slim Shot box opens and all 30 of the little creamers go flying out of the box and bounce all over the front of the store. People stop and stare and the only thing that comes out of my mouth is ” Oh my goodness”. I don’t move, I am frozen. I can’t pick anything up cause I have too much in my hands and I am so shocked that the very thing I was trying to keep to myself is now everywhere for everyone to see, that I just stand there and stare at all the little Slim Shots on the floor. Some nice man bends over and starts to put them back into the box, which is still in my arms. but the box is tilted down and they all fall out again. I continue to stand there – with my mouth wide open and looking like some little kid ( read idiot) who clearly has no idea what to do. The nice man takes the box out of my arms, fills it all up and puts it on the counter for me, the idiot. Finally I snap out of it just in time to thank him. I am thinking he thought weight loss was the least of my problems and probably I should have been getting some other kind of medicine for my very obvious other problem. Like being a fat head! I hope these things work – that’s all I can say. I hope they work. I’ll get back to you on this in a few weeks.